Etymology: melanocarpa comes from Greek "melas, melanos" which means "black" and "Karpos" which means "fruit", allusion to the black fruits. Origin: Canada (Quebec, Nouvelle-Écosse) and northeast of the United States. It was introduced into Eastern Europe and in the Scandinavian countries in the XIXth century. 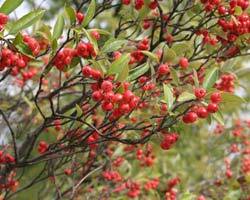 Habitat: the chokeberry is tolerant in soil, but it has a preference for acid soils, humus and moisture. It does not like the limestone. Site: half-shade or sunny. Shape: shrub, densely twiggy, spread. Deciduous foliage. Leaves alternate, simple, ovate to obovate and with toothed margin. Very short petiole. Bright top, dark green. In autumn, they turn to bright red with purple. Flowers in April-May. Clustered in corymbs on short downy peduncles, flowers have 5 rounded petals, of white colour, slightly blotchy of pale pink and many stamens. They resemble those of hawthorns. Fruits: small drupes becoming bright black with maturity, bitter and astringent taste. Fruits persist much of the winter. They are appreciated by birds (robins). 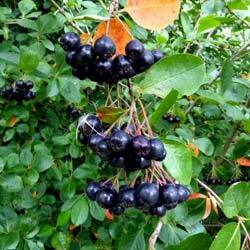 Use: Aronia is a nice shrub to be planted insulated or in massif. Its attraction comes from his abundant flowers and its persistent fruits. It is used in America for its fruit juice pure or blended with that of other fruits. It is possible to make jams or jellies (taste close to that of the blackcurrant), sorbets, syrups, vinegar. Berries are rich in Vitamin C, B2, B6, P. One discovered that they are rich in anthocyanin (hence colour made darker in winter), which is a precious antioxidizer in pharmacopeia, notably against cellular ageing by improving elasticity and density of the skin. Chokeberry contains 200-1000 mg of Anthocyanine by 100 g, which makes the richest fruit (red grapes 30-750; cherry 350-400; blueberry 80-420; redcurrant 80-420; orange ~200; mulberry ~115; raspberry 10-60). Aronia arbutifolia or chokeberry with arbutus leaves, red chokeberry. Flowers 1 cm in diameter are white or pale pink and the red fruit measures between 4 and 7 mm in diameter.